A visual, web-based interface for examining the ROS graph. 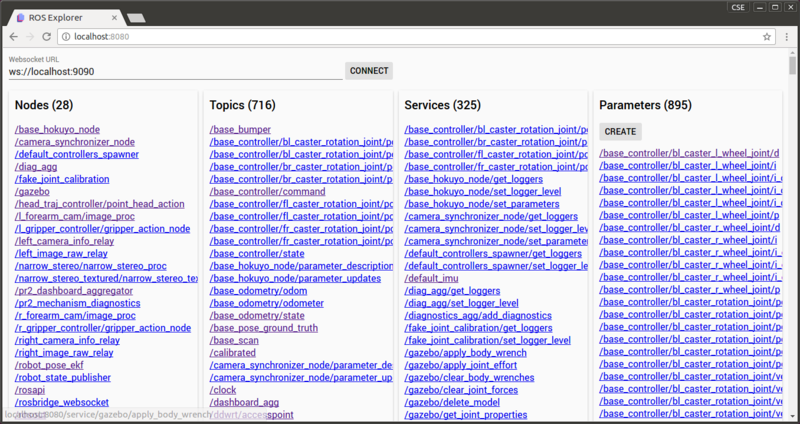 - See all the nodes, topics, services, and parameters. - Click on one to see what other nodes, topics, or services they are connected to. - See topic and service types. - Add/edit/delete parameters. Tested on Indigo, but likely works with newer ROS distros. ROS Explorer is a simple webpage, which you can serve from the www directory however you like, such as with python -m SimpleHTTPServer 8595 . You must be running a websocket server beforehand: roslaunch rosbridge_server rosbridge_websocket.launch. We also provide two launch files for convenience. - roslaunch ros_explorer ros_explorer.launch: Runs a Python server from the www directory and opens ROS Explorer in a web browser. To use this, you need xdg-open and python -m SimpleHTTPServer. The website will be served on http://localhost:8595. - roslaunch ros_explorer ros_explorer_websocket.launch: Same as above but also runs a websocket server. By default, the websocket URL is determined from the host the webpage is being served from (e.g., localhost, robot.university.edu). You can scroll horizontally to view names that have been cut off by holding Shift while scrolling. Press Ctrl+F to search for a name. ROS Explorer is built with Polymer. Run a local development server: - polymer serve - Visit http://localhost:8081 in a web browser. ROS Explorer works with RWS.